The criticism: "just words"; it "has a theosophical foundation". In reality, the document traces the path for cooperation in all fields: for the rebirth of the religious dimension to counter nihilistic materialism; for the defense of life from its beginning to its natural end; for the education of young people. The basis for affirming freedom of conscience, full citizenship for Christians in Islamic countries; the dignity of women. Some similarities with Benedict XVI's Regensburg address, falsely interpreted as "contrary to Islam". 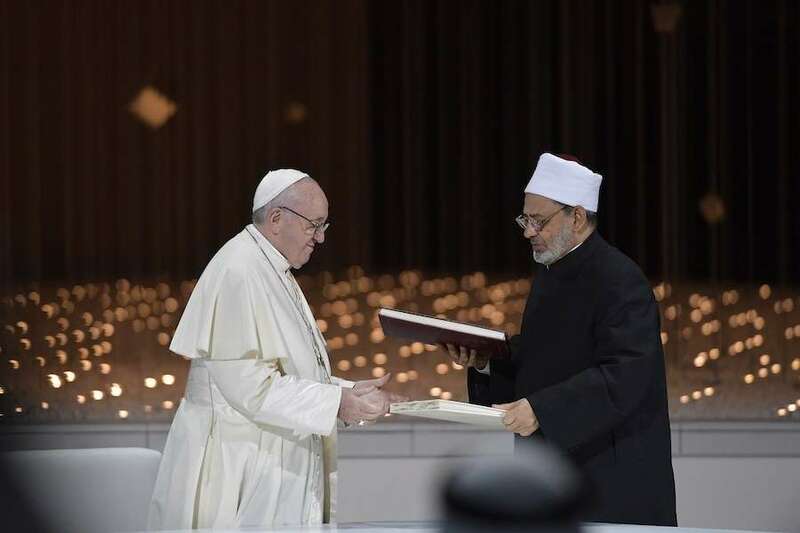 Rome (AsiaNews) - The "Document on human fraternity for world peace and living together", signed yesterday in Abu Dhabi by Pope Francis and the great imam of Al Azhar Ahmad Al Tayyib is of prophetic and revolutionary value: prophetic because it establishes how members of the religions should treat each other and especially Christians and Muslims, precisely when an "impossible coexistence" is being preached; revolutionary because it means not only aims to improve relations between faiths, but to restore a spiritual soul to the world of measure and profit. Someone has already dismissed it as "just words". It is true that a document is made of words, but they pierce the mind, illuminate it and indicate a direction: a word is always a revelation. The two signatories are also convinced of this and they speak of a "joint declaration of good and heartfelt aspirations" and ask "authorities, influential leaders" and all institutions to translate it "into policies, decisions, legislative texts, courses of study and materials to be circulated ". Others turn up their noses, saying that the document has a "theosophical" flavor. In reality, it seems to me that the document has a strong "creationist" basis, citing the "God who created all human beings", from Whom we derive rights, duties, commitments against war, the manipulated use of religion, etc. This underlining of the Creator God gives a clear religious taste to the motto "fraternity" which is in no way romantic or esoteric. There are some words in particular that must be underlined. First of all the choice to “a culture of dialogue as the path; mutual cooperation as the code of conduct; reciprocal understanding as the method and standard". The indifference and mutual ignorance of one's faith is in fact creating ever-greater barriers and suspicions. Many were amazed that there are living Christian communities in the emirates, which contribute to the good of society. This is because the dominant idea in the West is that Islam is intolerant and bloody. The same applies to Muslims, who confuse every Western thing, even the worst, as being "Christian". Another strong point is the critique of the " materialistic philosophies that deify the human person and introduce worldly and material values in place of supreme and transcendental principles", which turn people away from religious values ​​and eventually lead young people " to fall either into a vortex of atheistic, agnostic or religious extremism, or into blind and fanatic extremism, which ultimately encourage forms of dependency and individual or collective self-destruction". I find this point fundamental because it closely resembles the speech that Benedict XVI gave in Regensburg in 2006. That speech was manipulated, presented as "against Islam". In reality, Benedict XVI had affirmed that reason (and God) does not require violence, and above all, he pointed out that the elimination of the religious dimension from Western culture, or of instrumental reason, would have led to countless conflicts: exactly as this document suggests. A collaboration that has this religious dimension and fraternity as its starting point leads to a defense of family and life: “We therefore condemn all those practices that are a threat to life such as genocide, acts of terrorism, forced displacement, human trafficking, abortion and euthanasia. We likewise condemn the policies that promote these practices". In 1994, in Cairo, at the UN Conference on Population, unity between Islamic and Catholic countries had blocked the inclusion of abortion as a contraceptive method. We can only imagine what the collaboration of over a billion Catholics and another billion Muslims could mean to curbing the suicidal and deadly drifts of agencies for euthanasia and abortion and give meaning to life "from its beginning until its natural end". Then there are some words that are revolutionary for the Muslim world. At a certain point, the document speaks of "freedom of belief" and quoting the Koran at a distance, condemns "the fact that people are forced to adhere to a certain religion or culture". I think that this is the basis for a true freedom of conscience and freedom to change religion that is slow to come to many Islamic countries. We even read an invitation “to reconciliation and fraternity among all believers, indeed among believers and non-believers", accepting the presence of atheists in society, which usually fundamentalist Muslims consider worthy only of death. Moreover, reference is made to "full citizenship" in our societies, to renouncing "the discriminatory use of the term minorities", something the Christians in Islamic countries have often requested; of the commitment to women's rights; for the protection of places of worship; and to many other themes. The document even suggests a new non-conflictual relationship between East and West, in favor of one based on mutual collaboration: “The West can discover in the East remedies for those spiritual and religious maladies that are caused by a prevailing materialism. And the East can find in the West many elements that can help free it from weakness, division, conflict and scientific, technical and cultural decline". In order not to keep them only at the level of good intentions, the Catholic Church and Al Azhar have committed themselves so that " become the object of research and reflection in all schools, universities and institutes of formation, thus helping to educate new generations to bring goodness and peace to others, and to be defenders everywhere of the rights of the oppressed and of the least of our brothers and sisters".